For a couple of times I've spent my blogging time explaining how you can use MetaModel to query CSV files and Excel spreadsheets just as if they where regular databases which enable filtering, grouping, sorting etc. in their query languages (usually some form of SQL with more or less dialect). Notice that the <channel> element does not contain any data but only acts as what I would call a "wrapper tag". There are some different inner elements inside <channel> which causes MetaModel to name tables according to this shared root node. Hence the table names "channel_item", "channel_title" etc. A lot of values are contained in inner tags within the <item> elements, like the "title", "pubDate" and "link" elements. Since these appear only once for each <item> they are considered columns in a general <item> table: "channel_item". Notice the multiplicity of the <category> tags inside the <item>'s. This causes a seperate table to be created to handle multiplicity: "channel_item_category". As you can see we do a rather intuitive "XML to table-based model" mapping in MetaModel. This is done automatically through the process that we call auto-flattening of tables. If you prefer, you can also flatten the tables manually if you wish to compose the table model yourself (but I'll have to dedicate a seperate blog entry to that topic sometime). // Do something with the dataset! As you probably know I'm the founder and main developer of the Open Source project called DataCleaner. 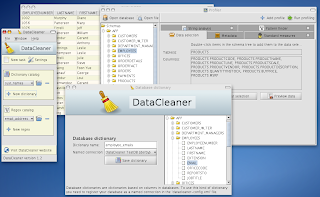 While there have been some notable contributions from outsiders I wouldn't be arrogant if I said that the crucial and main parts of the code-base for DataCleaner was written by me. But in a lot ways I often think of me as a medium of change, the bringer of the code, not the real source of the goal-setting and planning of the project. Also my main job in regards to DataCleaner have been to try and attract more developers and broaden the interest among users for DataCleaner, but that's not really relevant for this topic. In this blog post I'll investigate the relationship between me, the medium, and the community who represents the real decisionmaking entity of DataCleaner. I suspect that a lot of times people who participate in a community doesn't realize the powerful position that they possess and how they should utilize the mediums of change. What does this mean? This means that I don't set the goals for the project myself. Actually I have been doing so a lot but only because no one else did it. If the community was to say that they wanted the project to go in a direction I would be perfectly happy to help them. "I think you should carefully consider the overall purpose of DataCleaner and where you want it to go. Who are the users and how should DataCleaner be used in a broader context?" I absolutely agree on this quote but the thing is that I wouldn't be the one to make those decisions! I would probably have an oppinion but ultimately it's not my decision because I'm not the user, I'm just the medium of change. I think that the DataCleaner community should be better to involve themselves in these crucial themes, but I don't blame them because this is perhaps not a role that we are yet familiar with as Open Source actors. We need to recognize why the developers do Open Source software and when they are rewarded. This varies a lot from community to community but in the case of DataCleaner I personally get a kick out of it everytime say to me that they are using the product and that they think it rocks! This is my greatest reward. It's a lot greater than the times that people pay me money to help them with their problems (that may or may not be DataCleaner related). What does it mean that the greatest reward is the recognition of others? It means that you could effectively steer the development of DataCleaner simply by putting out your own goals and ideas for people like me to realize! Easy! This requires involvement and gratitude from the community but given that the community will be able to use the mediums of change in a far more effective way. Change the name of the application! We don't provide data cleansing. Rather we mostly do profiling and our validation engine is also rather OK, so perhaps we should think of more fitting names. Remove the separation of profiling and validation in the User Interface. The User Interface should rather reflect the process and provide convenient tools to the user instead of represent the internal entities of the application. These changes would definately imply a change to version 2.0 of DataCleaner because it would mean fundamental changes both to the User Interface and the core module. Those are just my 25 cents in the goal-setting debate. I think for Open Source to really prosper we need user-based communities who understand that they are not just "takers of software" they are also "givers of oppinions". MetaModel 1.1 have just been released! Head over to the eobjects.org news site to learn more about what this release is all about! Open Source acknowledged by the Data Quality community? 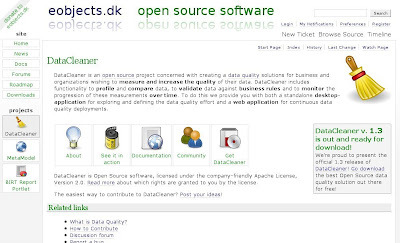 Here in Denmark I often feel that the Data Quality, Master Data Management and Business Intelligence field is pretty fearsome towards Open Source software. I think this largely has to do with lack of presence, a lot of prejudices and few established consultancy firms in this part of the world. Talking about getting the word out, where should you "advertise" your Open Source product to the business world? I personally think it's hard work to market your product even though you're giving it away for free and you would think that people automatically rushed to your website ;) Of course everyone needs to be aware that the software is here and I try a lot to put the word out there on conferences, wikipedia, sourceforge, freshmeat, ohloh etc.. But let me raise this question to everybody involved with marketing software for no cost: How do you do it? Why can't my masters thesis be more like my Open Source project? Looking aside from the fact that it deals with programming and not writing a paper (and trying to grow global awareness and knowledge on a specific topic) I thought to myself, that the cathedral-builder process is pretty similar to the process of writing a masters thesis. There are pretty strict guidelines to follow, a lot of scrutiny involved and planning by a dedicated few - in my case myself and my supervisor. So is there a room for another way, a more open process with distributed peers, continous redesign, short release-spans etc. Obviously there are things like wikipedia that provide this for topics of interest to the general public, but needless to say science projects often go beyond that level of information and have to deal with experiments, not just facts of life such as those in an encyclopedia. The beauties of this would be similar to the beauties of open source. And particularly in academia there's a strong need to be able to track down who's done what and source control management and reference-management would greatly improve on that account. For evaluators it would be possible to see the actual changes made by each student in group work, for group-working students it would be possible to track the actual changes to the project (as opposed to having to read it all over again everytime you exchange documents)... Perhaps a more "open" science would be just what we need? As we're moving steadily along towards the release of DataCleaner 1.5 we are fixing a few bugs and enhancing a lot of features. This leads to the desire to release our work since practically nothing has undergone changes that could destabilize the application since the 1.4 release. So today we're releasing DataCleaner 1.5 "snapshot". This also marks the first release under our new LGPL license. Change of license to LGPL. New profile: Date mask matcher. Although this is in principle a development/beta release, we feel that it would be worth working with for most of your profiling needs. So... Go on, download it, tell us what you think and we'll see you around! I hope you all enjoy the new version of DataCleaner! Whoa! I just got through my Lightning Speak about eobjects.org and DataCleaner at the Open Source Days '08 conference about an hour ago. It was a great experience - very fun and kinda stressing (in the good, "get to the point"-kinda way) to have an alarm clock counting down for your 15 minutes of fame! And in deed my presentation was very closely to the point. I wanted to tell people about the great creative projects at eobjects.org and especially about DataCleaner and the MetaModel project, which I dubbed a "derivative" project. My speak also quickly sketched the domain of data quality and people where nodding when I concluded that they all should download DataCleaner and give their datasources a quick profile the next time they worked on their projects. Unfortunately the format of the Ligthning Speak didn't allow for much time for comments and questions from the audience, but I hope and think that they had a good time! This blog entry could just as well have been a feature request but I'm going to kick-start it with a couple of thoughts I have for one of the crucial improvements to MetaModel that I've been dreaming about. The last couple of weeks have brought considerable interest in MetaModel, largely thanks to articles posted on the server side and infoq. It's been great to get the message out and it's also sparked a lot of great ideas from users/evaluators on the discussion forum. A couple of them have been requests that we build more advanced SELECT items into the query model. In this post I'm going to discuss type-casting and extraction functions and how they can be made possible using the new IQueryRewriter interface. The idea about query rewriting had been going on for some time, of course inspired by Hibernate's dialects. The thing was though, that for a start I wanted to skip dialect handling completely in order to get to know how far one could actually go without having to do any "hacking" in SQL. It worked out quite well but now that we need to incorporate more advanced, non-standardised features, we will of course need to be able to manipulate with the standard output. This is what the query rewriter is for, and in particular the AbstractQueryRewriter helps you do. I've made my first query rewriting "hack" today - using the TOP function for limiting the result set size, which is (as far as I know) only available in MySQL. We must take an interface-first approach - how would one most appropriately like to type-cast a select item in a query? I'm thinking that we should add a "castAs(ColumnType type)" method on SelectItem. Because not all of the ColumnType's are supported by all databases we should consider making a more abstract type enum. Something that will only contain a couple of more basic types like String, Integer, Decimal, Date, Boolean. We should use the query rewriting approach to generate the actual SQL cast syntax. Some databases use the CAST(x AS y) function, others use special-purpose functions like TO_NUMBER(x). Another feature that I want to include in MetaModel is functions for calculating or extracting something on behalf of a column. Let's take for example the YEAR(x) function (or in some databases the EXTRACT(YEAR FROM x) function). One would initially just think that we should add this function to the FunctionType enum and then take it from there. But actually it's quite a different type of function. While SUM, COUNT etc. are aggregate functions, the YEAR function is a single-value function, ie you can't call YEAR on a set of values. We can use the same approach as before (query rewriting) to handle different dialects, but we need to make sure that we pick function names that are widely accepted and understandable to the user. Personally I prefer YEAR(x) over EXTRACT(YEAR FROM x) as the syntax is clearer and there are no constants inside the parameter, which is more java-ish. The downside is that we will then also need a MONTH(x), DAY(x) etc. function but that's not a biggie I think. One last note - we should also consider if it's reasonable to keep using enums. Maybe we should switch to interfaces (and constants in the interface to ensure no API changes) for the sake of extensibility. I've been offered to address the Danish IT (Dansk IT) networking group on Business Intelligence next wednesday. I'll be concentrating on talking about Open Source business models, pitfalls and opportunities and an overview of the Open Source BI market including demos of various tools - including DataCleaner of course. I'm thinking this is a great opportunity to get people involved with OS BI - an area that has been somewhat overlooked, at least in Denmark, I think. Update: Just got home from the networking group and it was a very interesting day sparked with lots of discussions and perspectives on BI products. I can't say that everybody was convinced with going Open Source for their BI solutions but they definitely got an impression of what goes on and most people there was very interested in DataCleaner, perhaps because of the few implications it has on the rest of the BI portfolio to apply our data quality solution. Update: You can now download my slides about Open Source Business Intelligence and please let me know what you think. As some of you may know DataCleaner started as an academic project for me, investigating how Open Source projects are established, managed and developed. I've been waiting for a long time for the evaluation of the project but yesterday I finally got the results, and I'm proud to announce that I got the top-grade for the assignment! (12 in the danish grading system, which spans from -2 to 12 - I'll have to blog about the grading system some time, it's hilarious). I would appreciate any kind of feedback on my research and I don't mind critics now that I have the acknowledgment of Copenhagen Business School, heh. This was one of the last TODO's with MetaModel in this round so I think we're going to release version 1.0 pretty soon! Stay tuned. I'm starting to get real excited about releasing version 1.2, it'll be a radical improvement in terms of both visual experience and functionality I think! Even though the JDBC spec. defines a way to specify the fetch size when executing queries, some drivers do not implement this feature, which means your program will run out of memory if you query eg. a couple of millions of records. Even if your driver works as it is supposed to (that would be a reasonable assumption in most cases) there's still no effective way to optimize the computation of the many records by multithreading since the data is streamed through a single connection. Consider we want to split up the query: "SELECT name, email FROM persons"
I'd love to know what you all think of this? Personally I think it's a lovely way to optimize memory consumption and it offers new ways to utilize grid computing by distributing partial queries to diffent nodes in the grid to do remote processing. Also a lot of databases (MySQL for example) only dedicates a single thread per query - so by splitting the queries one could further optimize multithreading on the database. I've just added a new feature to DataCleaner that I'm very happy with. Now when you see a profiling result you can interact with it and drill to details on measures of interest to gain insight into how those measures are composed. Consider the screenshot below (sorry for the ugly window borders, I'm running linux here and we're still trying to tweak the UI to look sweet with the jgoodies look'n'feel). What you're seeing is that the pattern finder identified a couple of patterns for the ADDRESSLINE2 column and I've just clicked the "aaaaa 999" pattern to find out which value where categorized to fit this pattern. This queries (drills to details) the datastore for these columns. Similarly I could have wanted to find out which values yielded the "max chars", "min chars" or other measures in the profile result matrix above. If I do that it will similarly query the values that originated the measures. The code above is a slight rewrite of the real code for String analysis and it shows how easy it is (and ought to be) to attach a query to a value in a profile result! Drill-to-detail features are now a common thing in DataCleaner and in my oppinion it leverages the use of the profiler functionality to a new level. MetaModel is now a part of the DataCleaner stack! Traversing a database (schemas, tables, columns, relationships etc.) becomes as easy as it is to traverse any other domain model. Building and manipulating queries can be a continous and type-safe process. This gives us the opportunity to do meaningful fault-tolerant query-modifications in order to recover from database-insufficiencies and to enterpret the query not only as SQL, but as a generic query built for non-SQL datastores. It is possible now to mimic a database with other data technologies, for examples flat/csv files, excel spreadsheets, web services or hardcoded datastores. Building systems to support the database structure (for example metadata applications) becomes possible without extensive JDBC hacking. Anyhoot, look no further, because we have invested considerable time into these issues by developing eobjects MetaModel. Let me show you how you build queries using the MetaModel framework in a totally type-safe manner! Of course in this example a couple of hardcoded values are entered such as the "customers" literal, but I could have just as well traversed the schema by going through every table without any hard references. //yields: "SELECT p.product_type FROM products p GROUP BY p.productType"
//yields: "SELECT p.product_type, SUM(p.price) FROM products p GROUP BY p.productType"
//yields: "SELECT p.product_type, SUM(p.price) FROM products p WHERE p.market_year > 2004 GROUP BY p.productType"
//yields: "SELECT p.product_type, SUM(p.price) FROM products p WHERE p.market_year > 2004 GROUP BY p.productType ORDER BY p.product_type"
2) Let's create a schema object for an easier, object-oriented way of accessing the data. 3) Let's try exploring our metadata, consisting of schemas, tables and columns. //This next int represents one of the constants in java.sql.Types. 4) Time to make a query or two. Let's start off by just querying the whole table and then querying two specific columns. Notice the IData.getCount() which is crucial to understand. The data factory will try to generate a group by query to optimize the load on traffic between database server and client. Sometimes this is not possible though (for example for TEXT types in Derby, where GROUP BY is not allowed). The getCount() method returns how many occurances there are of this distinct combination of values, represented by the IRow interface. So make sure to always check the count, maybe there are less rows in the result than in the actual database, because the results have been compressed! Observe in general how strongly typed an API this is. In other data-oriented API's one would have to type in the same column name several places (at least in the query and when iterating through the results) but with the DataCleaner-core metadata and data layer we get a completely object oriented and type safe way to do this. The amazing thing about this API is also that we could have just as well done the same thing with flat files or other data source types. I've been fiddling around with this problem for some time now and I finally got all the pieces together so I guess I'd better share my newfound knowledge on these obscure topics that I hope I'll never have to encounter again. It all started with a new fine and dandy testframework called uispec4j, that we wanted to use for DataCleaners GUI. Uispec4j is supposedly "Java GUI testing made simple" and so they caught our attention because the code coverage of DataCleaner GUI was not that impressive (yet, if you read this blog post and a lot of time has passed, it may hopefully be looking better). So we started of by creating some neat unittests for DataCleaner GUI, using uispec4j. Hurray. They worked fine and dandy on our Windows development machines so we uploaded them to the repository and into the Continous Integration loop. This is where hell broke loose. Then came the next problem. When starting X a fatal error occurred, telling me that no screens where installed. That seems fairly reasonable, but what the heck should I do about it? I decided to install a VNC server to host a remote screen. This would hopefully rid me of my troubles, since I didn't have the (physical) room for installing a monitor for the damn thing. But that didn't work either because Hudson doesn't comply with the damn thing :( I tried to set that "awt.toolkit" system property using some static initializers (which I generally think is a poor, poor, poor thing to do in Java in general), but guess what? Uispec4j is filled with static initializers as well, so that brought me no guarantees whether or not I was the first static initializer run. (edit: Apparently I might be wrong in this claim about uispec4j, check out the comments for more details). Finally I got a new version of Hudson that had a per-project configuration of MAVEN_OPTS and that did the job. The last issue was actually a JVM issue. I had to change the runtime user of my J2EE container to be the same user that hosts the VNC server instance. If you try to access another users desktop, the JVM turns fatal. So don't touch my desktop or you'll get your fingers burnt! Ah and a last thing about GUI testing: Make sure to set the Locale in your junit setUp methods or else the unittests won't be portable between computers if they have different languages and you assert on the labels of UI elements. "You should test functionality and domain models through unittesting and test UI through UI!" There seems to be quite some frustrations for old ANT-users switching to use Maven so I thought I would make a small post about the main differences and various hacks that are useful to know as a Maven user. The good thing about ANT is that you can always hack your way around a problem and it's quite easy to find the problems that are stopping you. The bad thing is of course that the build-files seem to grow enormously and that you have to enforce your project infrastructure with some kind of common JAR-download area like a FTP or something similar. In contrast Maven focuses not on the build as a process, but more on the content of the build, because in 99% of the times the process of building a java project is pretty much the same, so why not omit the "how" completely and only focus on the "what" of your build? This "what" is configured in the pom.xml file! Maven automagically creates a local repository for all the JARs you use in your projects. There's also a central repository where maven will download the JARs from, if they are not found in the local one. If you are working offline or behind a proxy and you need a new JAR you're bound to mess this up :( When Maven can't find it's JARs in the central repository or locally it will blacklist it! The install goal will build the project, run the unittests, verify that everything worked and then install the resulting JAR/WAR/Whatever into your local repository. This means that you can then use the project as a dependency to another project, smart eh? 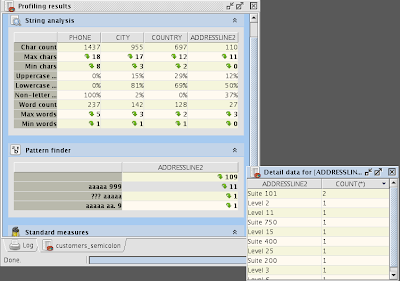 Create a nifty project site with all sorts of nice information and reports (javadoc, unittests, codecoverage etc. depending on your configuration). Ah, the "skip test" parameter. I spent a long time figuring that one out. This is handy if you're working with several projects at the same time and you've (consciously) broken the build and want to keep on using the dependency. Let's take a look at how to get the data of a CSV file. This will give us the data of the file using the same interfaces as JDBC-databases, excel-files and possibly other data sources.